Which alert to look for? A Warning (red) a Watch (yellow) or a Statement (grey). If we were north of Toronto in Barrie, there is both a wind and snow squall warning. Here in Niagara, it is a wind warning so our map of Southern Ontario shows red in Niagara. The colour code of red for danger has been use for quite a while. The British newspaper ,The Telegraph has an article about it, written in 2008. Red is take action. Orange is be prepared, Yellow is be aware, and Green no severe weather. Yesterday's satellite radar image showed green rain flowing from the south to the north, except at Grimsby - pink and red for freezing rain. Code systems using colours are common in hospitals. While hospital system codes vary between countries and provinces, code blue inevitably means cardiac emergency. Doctor codes - paging Dr. Sinclair - uses a doctor's name as a code word for a dangerous situation or a patient in crisis. There are a lot of potential crises in hospitals - the codes vary from flood, fire, gang activity, bomb, child abduction and so on. In comparison, the U.K. hospital codes are numeric - 2222 crash call, 3333 security alert, 4444 fire alert. But mostly where safety is involved, there are color codes for labelling and communicating - this is universal in all industries and businesses with any kind of safety concerns. Back to our weather - it has been on alert for most of the week. We had to cancel the big closing evening of the Fantasy of Trees last night because of freezing rain, high winds, and black ice warnings. And add to that a freezing fog earlier. I didn't even know there is such a thing as freezing fog. 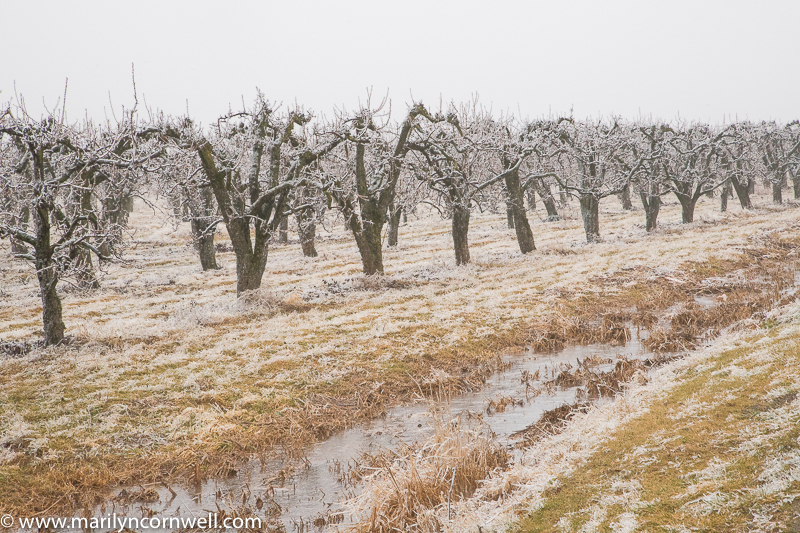 So our pictures today show the John Street orchards, covered in ice an inch or two thick. 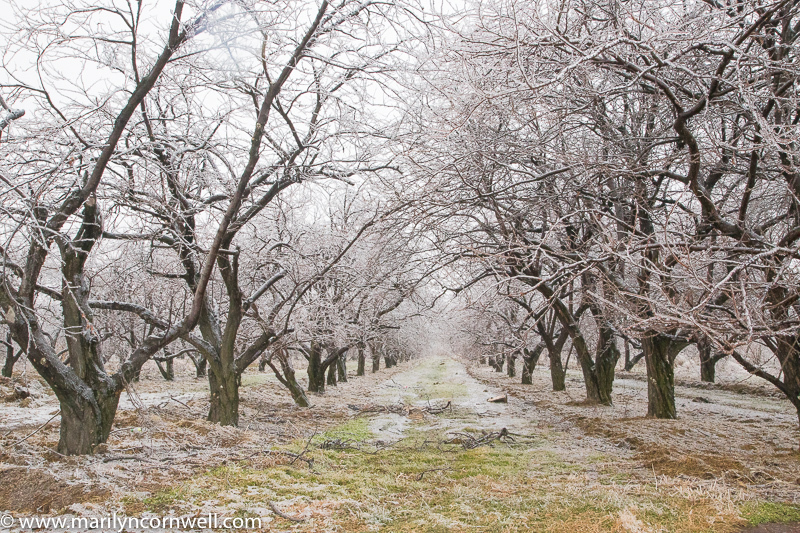 Everything is white, like an infrared landscape. 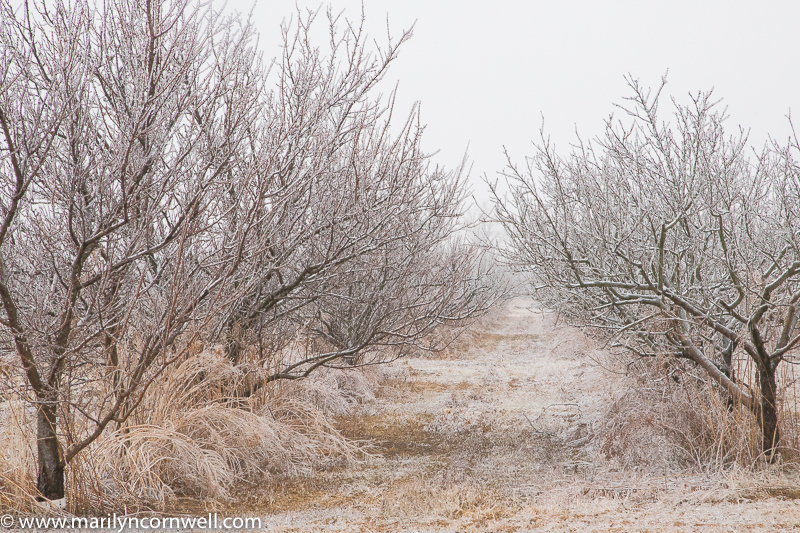 It was a surreal landscape - white from top to bottom.